Brett Deschene at Mirada Fine Art, After the Fog, Mixed Media/Encaustic, 30" x 48"
Using a practice dating back to 100 A.D., Atlanta-based artist Brett Deschene employs “encaustic painting” to his mixed media creations: adding numerous layers of pigmented wax to an image to build the surface and add dimension. The intentional pitting, rolling and gentle undulations of these works give a stunning new depth to the American landscape. Mirada Fine Art is proud to present Brett’s first exhibition in Colorado entitled ‘After the Fog.’ This exhibition is featured in the January edition of American Art Collector and will run through the month of January. Brett Deschene at Mirada Fine Art, Breaking Day, Mixed Media/Encaustic, 40" x 72"
Brett Deschene at Mirada Fine Art, Dusk Reflecting, Mixed Media/Encaustic, 48" x 48"
Brett Deschene at Mirada Fine Art, Native Fields, Mixed Media/Encaustic, 40" x 30"
The addition of artist Andrew Baird to Mirada Fine Art unites the Best Artist in Colorado as declared by the editors of 5280 Magazine, and the Best Gallery as voted by the magazine’s readers. The works of fifth generation Coloradoan Baird perfectly embody the pairing of contemporary art with a Colorado feel. 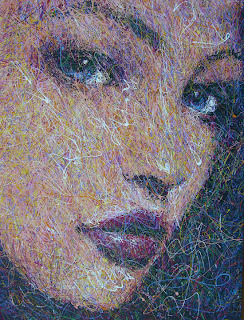 Andrew Baird at Mirada Fine Art, Olivia, Acrylic on Canvas, 48" x 36"
His works are stunning at both a distance and when studied up close. The process to create each piece is equally fascinating. Baird uses a simple wooden ‘stir stick’ to drip acrylic paint onto a canvas on the floor, initially creating a rough sketch. The first few colors lock in the features of his subject. He revisits the painting each day, adding new color and creating dimension with light and dark values. “Each time, I drip paint to either lose the image or strengthen it,” states Baird. “I build layers of color until the painting has the quality I’m striving for. Every painting takes on a fascinating life of its own. I like it that people study each painting and think about its creation­—this is artwork that actively involves the viewer.” Vibrant color combinations allow the subject to intriguingly ‘appear’ and ‘disappear’. The diversity of faces and the amazing and unusual way Baird portrays them draws us all in. Andrew Baird at Mirada Fine Art, Sheryl, Acrylic on Canvas, 45" x 53"
A true Colorado native, Andrew Baird lives and works in Evergreen. He has worked as an artist and art educator for thirty years. Mr. Baird earned both his B.A. and M.A. in Fine Arts from the University of Northern Colorado. His striking paintings have been displayed in exhibits and galleries throughout the U.S. and internationally. Baird’s pieces are held in private and corporate collections alike, including those of Robert Redford and the Chicago Mercantile Exchange. Andrew Baird at Mirada Fine Art, We the People, Acrylic on Canvas, 39" x 66"
Andrew Baird at Mirada Fine Art, Katrina, Acrylic on Canvas, 48" x 36"
Andrew Baird at Mirada Fine Art, Heart, Acrylic on Canvas, 53" x 45"